From the webmaster: while our staff gets ready to enjoy Passover/Easter weekend, I thought I would share this article from November of 2009. The village may have won an award for transparency in 2015, but we missed the opportunity to redefine open government. The village of Bolingbrook has decided not to participate in Google’s top secret test of Google Government. A screenshot of Bolingbrook’s version of Google Government. It was tested in 2009 but never purchased. Although Google denies its existence, an Internet site claims that Google is working on applications that could change how democratic governments are run and could eliminate the need for politicians. Sources who attended Google’s presentation with Mayor Roger Claar deny that it would eliminate politicians, but said it would be the ultimate in government transparency. Google representative Peter Z. Alberts started the presentation by saying that Google Government takes full advantage of cloud computing. “Wouldn’t it be expensive to keep village hall under constant cloud cover?” Asked Claar. Alberts explained that cloud computing really means that the programs and files would be on offsite servers instead of on individual computers. This would save the village money because instead of buying a license for each computer, the village can buy cheap netbooks and employees could do all of their work using web browsers. Claar explained that he was still “an AOL man” and didn’t understand all “this cloud stuff.” He asked why all the information needed to be online. Alberts replied that Google Government is committed to open government. By putting all documents online, the public can easily access any document. This would save the village thousands in FOIA fees because any document would be available at the click of a button. Alberts added that putting government information online makes it easier for residents to help out the village. “Crowdsourcing” could save tax dollars that otherwise would have gone to outside consultants. The sources say Claar glared at Alberts. “If you say so.” Replied Claar. Alberts continued by saying that Google Government was more than a word processing and data storage application. He said it could replace the trustees. Google would provide free wifi to every village resident. By monitoring the residents’ internet traffic, as well as scanning their Google documents for certain keywords, Google Government can create six virtual trustees that can accurately reflect the residents’ moods and opinions. When Claar asked how his campaign fund fits in this new structure, Alberts smiled. Sources say that Claar stood up and told Alberts that he was rejecting Google Government. Alberts, according to the sources, apologized for offending Claar, then said he would pitch Google Government to Lisle’s Mayor Broda instead. This reporter then heard the sound of breaking glass. This reporter then heard a scuffle, followed by the man screaming in pain. Two other men read the man his rights. The man replied that his First Amendment rights were being violated because he won’t be able to access the Village’s wifi network in his cell. We get it. You don’t want to choose from among the three establishment political parties. You don’t want to cast a write-in vote that will not be counted. You want to make a statement. You don’t want the tabulator to record that you didn’t vote for an approved candidate. You want to make a statement to the tabulator before they record that you didn’t vote for an approved candidate. We hear you. So we would like to recommend these alternative political parties to write on your ballot. You’ll make a statement, even if your vote won’t count. For those of you who lean to the Right, we recommend voting for the Zero Tax Party. We still haven’t figured out how “Zero taxes=Infinite revenue!” Maybe it’s based on the same economic principle that allowed the Bolingbrook Park District to lower their taxes and generate more revenue for the playgrounds? We don’t know. However, we do know that many of you don’t like to pay taxes, and reject the notion that taxes are the cost of maintaining civilization. There’s no better way to tell the government that you hate paying for the police, fire department, and roads, than to vote for the Zero Tax Party. For those of you on the Left, we recommend voting for the Al Gore Party. They are right when they state that the climate that Bolingbrook expanded under is going away. Bolingbrook will have to deal with periods of too much rain followed by too little rain. Potential crop failures, refugees from the Southern United States, and more dangerous heat waves, will impact our community. Now a village board under Bolingbrook United might be more receptive to an environmental message. Or, maybe Claar might act if enough residents demand action to deal with climate change: But that wouldn’t be making a statement like writing “The Al Gore Party” on your ballot. Politics in Bolingbrook can be messy— Especially when people from Edgar County insert themselves into it. But why make compromises or risk the wrath of Claar when you can easily make a statement by voting for one of these two parties? Three aliens were arrested and charged with dropping a blue whale carcass near the Sixth hole of the Bolingbrook Golf Club. The aliens pleaded not guilty and asked to be represented by Bolingbrook attorney Joe Giamanco. The judge informed them that Giamanco was not licensed to practice interstellar law, and assigned an attorney for them. Guzman insisted the whale was dead when the aliens found it in the ocean. The New World Order wants to question the crew members regarding a whale that was found in the Amazon. “I have no idea what you are talking about,” said a man who sounded like Carpanzano. The man screamed in horror. Sources —who have friends with relatives that have a connection to village hall— say Mayor Roger Claar recently hired wereskunk bodyguards. A receptionist for Claar said he was busy, and there was a line of people waiting to see him. A man who claims to be Bolingbrook’s only billionaire announced his plans to support the Bolingbrook First Party in the April 2 Village Trustee election. 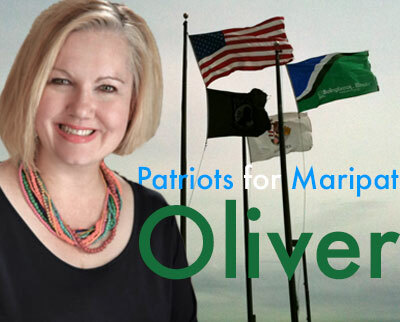 This graphic could soon be featured on the Patriots for Maripat Oliver website. “Bolingbrook First” is one of two names Mayor Roger Claar has used for his political party, along with “First Party for Bolingbrook.” For the 2019 election, Claar’s endorsed candidates are running as the First Party for Bolingbrook. Maripat Oliver, however, was able to file as a candidate for Bolingbrook First, and her candidacy was not challenged. Instead of donating directly to Bolingbrook First, Zinn will form several Super PACs to back Bolingbrook First. Zinn unveiled designs for the websites for his Super PACS: “Citizens United to put Bolingbrook First,” “First Voters for Bolingbrook,” and “Patriots for Maripat.” He said that together with Oliver’s website, residents will know that Bolingbrook First believes in fighting for residents, higher wage jobs, low taxes, more growth, fiscal responsibility, and garbage can reform. Voiceover: Of all the people running for Bolingbrook Trustee, only one has stood up to the Edgar County activists attacking our village. Video of a police officer approaching a man speaking at a DuPage Township meeting. The man will not stop talking. Oliver: He has gone way over time, and he’s being very disrespectful. The man is removed from the meeting. Dissolve to a video of a waving Bolingbrook Flag and an image of Oliver. Voiceover: Any party can brag about being first. 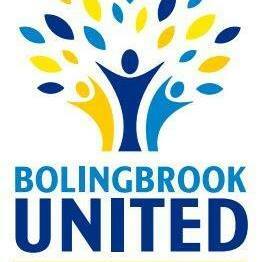 Dissolve to the Bolingbrook First logo. Voiceover: Only one party puts Bolingbrook First. The second ad starts with an older woman in her living room. Woman: I’ve lived in Bolingbrook for many years. I’ve seen many elections and spoken to many candidates. This year, I’m voting for a party that knows Bolingbrook almost as well as I do. She opens the front door. A younger female candidate speaks. Woman: First party for Bolingbrook? You seriously think you’re the first party that’s for Bolingbrook? Woman: Bob Bailey was one of Bolingbrook’s founding fathers. He served as mayor and would have served a second term if the Federal Government hadn’t driven him out of town. Are you saying he wasn’t for Bolingbrook? Woman: Bob meant business. You mean nothing to me. Candidate1: Oh yeah? Well, I bet I have more homestead exemptions than you do! Anyway, I’m voting for the only party that really cares about Bolingbrook. She opens the door and sees another candidate at the door. Candidate2: I’m running for Village Trustee because I care. Woman: I know you. You’re the trustee who didn’t care when wrong information was printed in the Village Directory. If you didn’t care about that, why should I expect you to care about important issues like our debt or our overpriced water? She opens the door and sees another candidate. Woman: What are you, a walking resume statement? No real person talks like that. She slams the door on Candidate3. Woman: I’m voting for Bolingbrook First. Woman: Because any party can say they’re first. Only one party puts Bolingbrook First. All of Bolingbrook’s parties spokespersons refused to be interviewed for this story.